I’ve noted a number of times that I was less than impressed with what I tasted of K&L’s selections for 2013 (most of which showed up in early 2014 for reasons outside their control). Despite having resolved to “try before buying” as far as possible for their future selections I was predictably unable to resist getting some of their 2014 selections when they showed up early this year. I’ve already reviewed one of these, the Hepburn’s Choice Craigellachie 18, which I quite liked. The other two that I purchased are both cask strength bottles from Signatory (though in the livery of the regular UCF series rather than the decanters—a change I welcome heartily). One is a Glenburgie 19 that I hope to review soon; the other is this Glen Ord 17. Both of these are distilleries whose malts I enjoy more often than not, and both of these are also distilleries whose malts are not often available in the US—which is my way of justifying my lack of self-control. Anyway, let’s see what this is like. 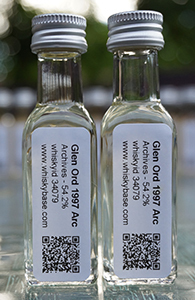 This Glen Ord was part of the fourth release of Whiskybase’s Archives series in 2012. 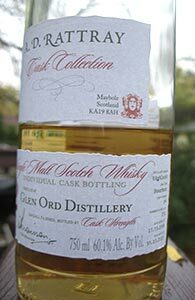 I don’t think they’d started selling samples then and though I was very intrigued—I’ve not had too many Glen Ords but I’ve liked all the ones I’ve tried quite a lot—I was put off chancing my arm on a full bottle by the low scores it received from the Whiskybase community. And then I kind of forgot about it. Recently, however, I noticed it was still available at the store and that samples were now also available, and so here I am. What a deeply uninteresting introduction this has been. Let me see if I can manage another paragraph that can compete with it. 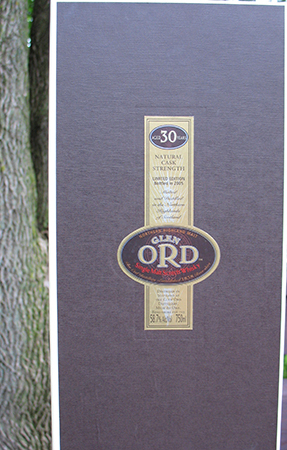 I’ve previously reviewed the excellent Glen Ord 30; today, the Glen Ord 25 which was released a couple of years prior. The actual bottle is far more attractive–and identical to that of the 30 yo–than this repurposed miniature in which I received my sample from another whisky geek. 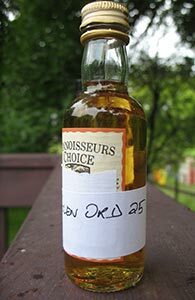 Back in the mid-2000s Diageo released a number of these Glen Ords in their annual special releases–in addition to the 25 and 30 there was also a 28 yo. I guess the 30 yo (released in 2005) really didn’t sell well; there’s been nothing from Glen Ord since then (other than the regular younger entries in the range). Inside this ugly shoebox is a rather attractive bottle. Glen Ord is located in the northern Highlands, in the same part of Scotland, generally, as Balblair, Pulteney, Clynelish and Glenmorangie. And in my limited experience there’s a significant intersection in the profiles of the whiskies from these distilleries (I am referring here to the classic Glenmorangie profile, and not to all their experimental finishes etc.). Their mainline malts generally eschew sherry, and (with the occasional exception of Clynelish) they generally have a very light hand with the peat as well. The profile tends, therefore, to be relatively austere with the fruit mostly in the apple/pear family with the occasional stone fruit, and the emphasis coming from briny notes rather than smoke. Some would say that it is in this profile that you come closest to tasting what Scotch whisky is all about, away from the extremes of sherry or peat. I am not a fundamentalist in that sense but I have come to enjoy it far more than I did when I first started drinking single malts in anything but a casual manner–in the beginning, I fear, I found it a little boring. I don’t mean to suggest that this a common or necessary evolutionary development but it took me a while to begin to appreciate the subtler charms of this style of whisky. It was a cask strength 11 yo Glen Ord, 1998 from Signatory (cask 3475) that first opened my eyes and so when I found this bottle quite deeply discounted a few years ago I jumped on it. This was part of Diageo’s annual special release in 2005, and I guess the lack of familiarity of the name kept it from selling out. These days it’s mostly available, where it is, closer to the list price of $250, but you can still find it for considerably less if you look hard enough. I certainly think it’s worth the trouble.